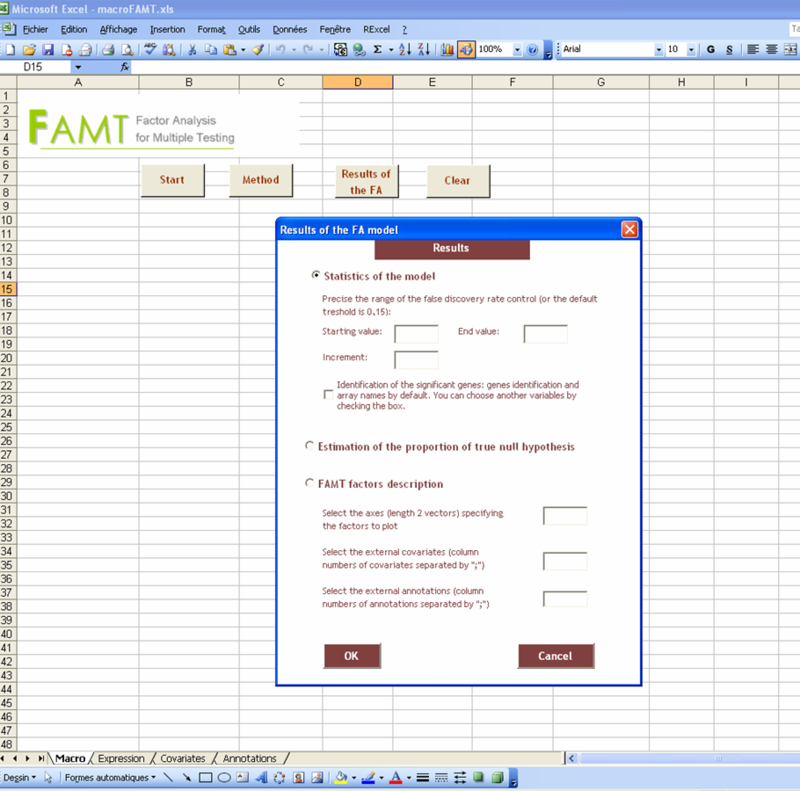 The FAMT macro is an Excel interface to use the FAMT R package. 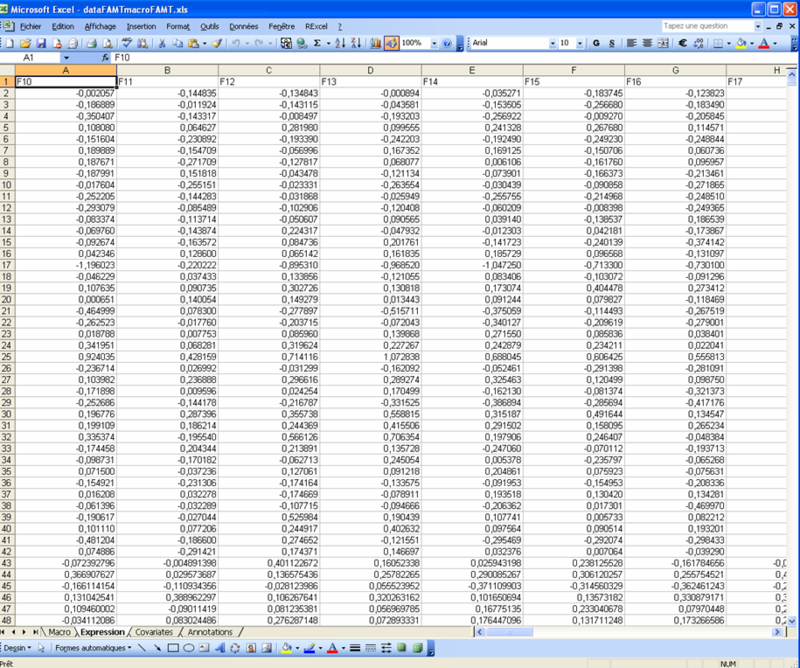 The use of R through Excel is possible thanks to RExcel. Make sure R or Excel are not running then launch RAndFriendsSetup2111V3.1-5-1.exe. Follow the instructions to install R 2.11.1, statconnDCOM, RExcel and RAndExcelWorkbooks. Once everything has been installed, a new icon appears in your desktop. This icon integrates RExcel. A new tab "RExcel" (or "Complements" depending on your Microsoft Office version) has been added. Two versions of the graphic interface are available: one interface has been developped with Excel 2003 and the other one with Excel 2007. Some guidelines about the macro Excel 2003 are given below. 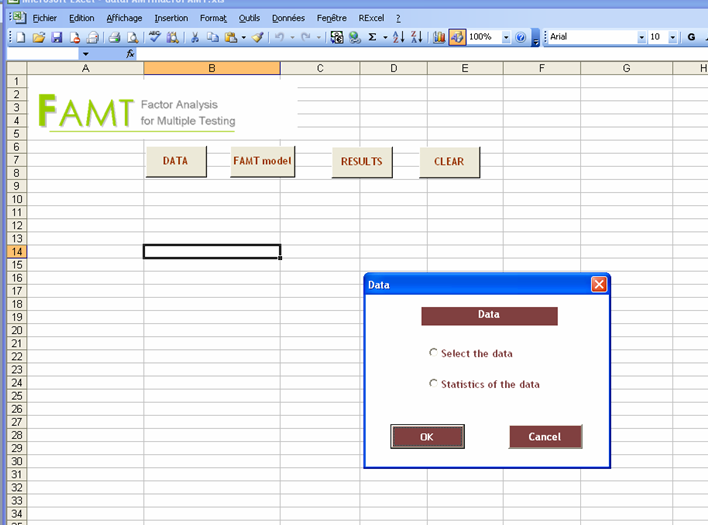 The FAMT interface for Excel 2007 works in the same way but the buttons appear in the Excel Ribbon. - The “Macro” sheet displays the results of the implementation of the Factor Analysis for multiple testing package. 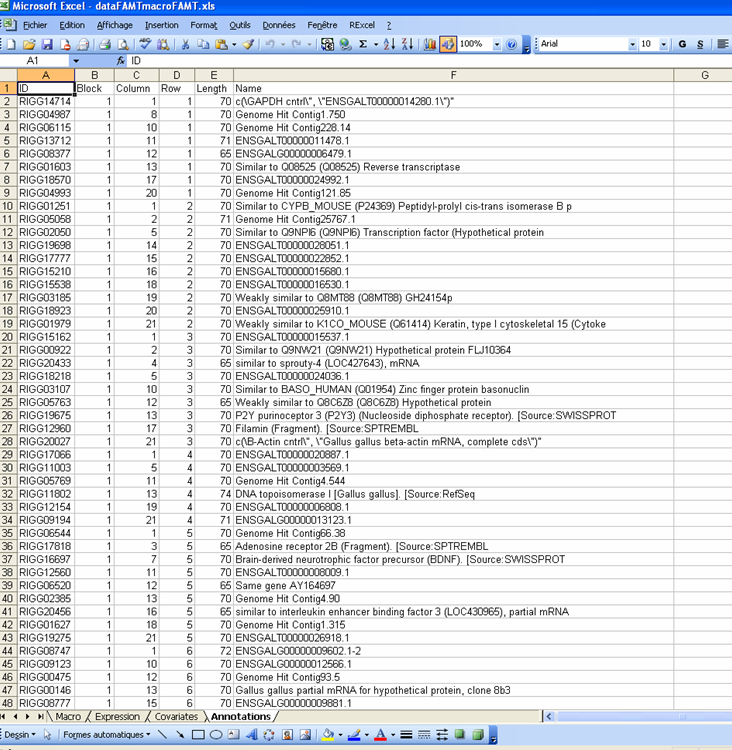 - The “Expression” sheet contains the gene expressions data frame: genes are in rows without row names and arrays in columns (the column names are the identifier of arrays) (see figure 2). - The “Covariates” sheet gives information about the experimental conditions: the identifier of each row (arrays), as used in the column names of Expression, is provided, with the value of the main explanatory variable in the testing issue and possibly other covariates (see figure 3). - The “Annotations” sheet provides additional information about the response variables of the multiple testing procedure to be used to describe the results. 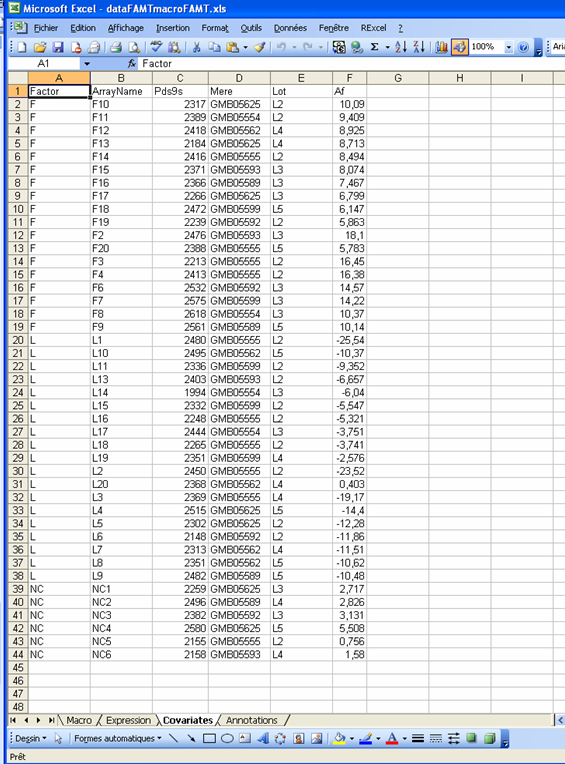 One column must be named ID and gives the variable (gene) identifier (see figure 4). The data must be stored in each sheet as above-mentioned. Note that Covariates and Annotations datasets are optional.The number of columns of expression must correspond to the number of rows of covariates and furthermore expression and annotations must have the same number of rows. If covariates dataset is not provided the procedure aims at testing the significance of the mean expression. If annotations dataset is not provided, a basic annotations dataset is created with row indices as variables identifiers. Import your data (copy and paste the data in each sheet or use the excel menu via import extern data). Be careful to the decimal mark (comma or point). The following figures present the different sheets with the data provided in the package. This dataset concerns hepatic transcriptome profiles for 9893 genes of 43 half sib male chickens selected for their variability on abdominal fatness. Another sheet, called graph, is automatically created to store all the graphs provided by the functions of the package. The buttons in the Macro sheet allow to run the package by step. Some guidelines about the macro are given below and in the help file. The DATA button enables you to define the datasets, to create the FAMT data and to summarize the FAMT data. You have to select the available datasets (expression, covariates and/or annotations), then some other dialog box allow to precise the class of variables. 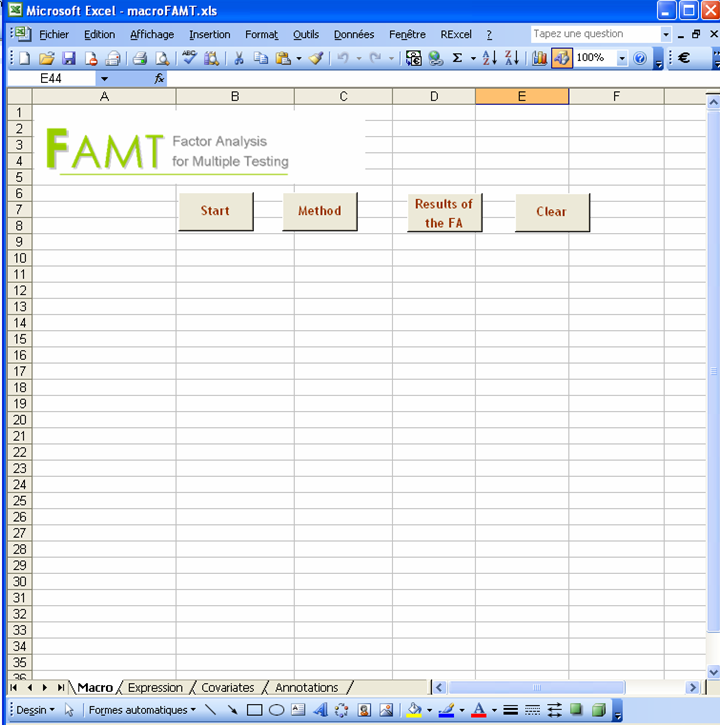 The FAMT model button enables to implement the FAMT complete multiple testing procedure. 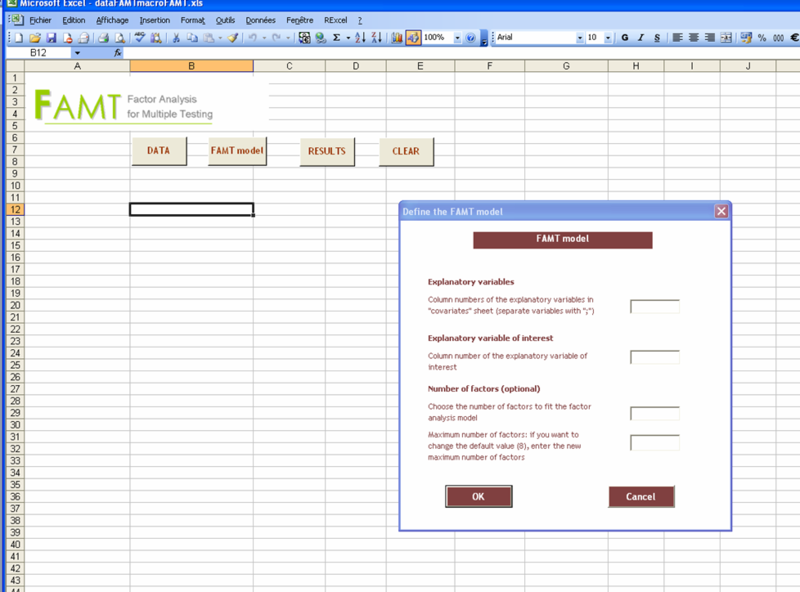 This step builds the FAMT model and enables you to analyse the results (with the Results button). You can fit different models but the last one is used for the analysis of the results. The RESULTS button proposes three functions to analyse and display the results. The first function provides information about the rejected genes, the second one gives an estimation of the proportion of true null hypotheses, and the last one helps the user to describe and interpret the factors. Details to fill the form are given in the help file . Results are displayed in the Macro sheet. For each request, the results (tables or comments) are cleared and the new results are shown. The CLEAR button clears the Macro sheet and the graph sheet (this sheet is automatically added with some functions).